Ceslaus Odrowatz was a near relative, probably a brother, of Saint Hyacinth, and shared with him the apostolate of Northern Europe. Little is known of his youth. He was born in the ancestral castle and educated with Saint Hyacinth, by his uncle, a priest of Cracow. Both young men became priests and, being well-known for their holiness, were chosen to be canons in the cathedral chapter in Cracow. When their uncle received an appointment as bishop of Cracow, the two young priests accompanied him on his trip to Rome, where he would be consecrated. It was in Rome that the two zealous young priests first heard of the work of Saint Dominic. The order was then only four years old, and its eager members had penetrated to almost all parts of Christendom and were pushing into the lands of the Tartars and the Mohammedans. The new bishop strongly desired that some of the friars should come to Poland. Since Saint Dominic was then in Rome, they went to him for missionaries. 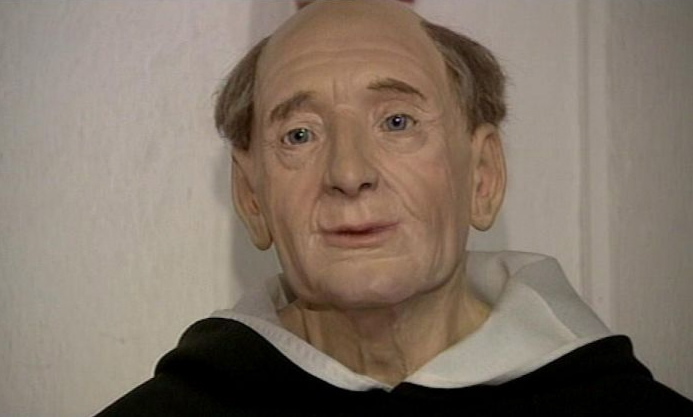 Dominic was deeply regretful that he had no friars who were able to speak the languages of the North. However, he was much drawn to the bishop’s two young nephews, and promised to make them Dominican apostles if they would remain with him. After their novitiate training, Hyacinth and Ceslaus went home. Ceslaus went to Prague, and other parts of Bohemia, where he founded convents of Friar Preachers and also established a group of nuns. Then he went to Silesia, where he founded the convent of Breslau that was to become his center of activities. He also acted as the spiritual director for duchess Saint Hedwig of Poland. The life of Blessed Ceslaus, like that of Saint Hyacinth, is a record of almost countless miracles, of unbelievable distances travelled on foot through wild and warlike countries, and of miracles of grace. He cured the sick and the maimed, raised the dead to life, and accomplished wonders in building convents. His most remarkable miracle was the raising to life of a boy who had been dead for eight days. In 1241 the Tartars swooped down upon the Christian kingdoms and laid waste the labor of centuries. Blessed Ceslaus was in Breslau at the time the Tartars laid siege to the city. He and his community fasted and prayed incessantly that the city would be saved, and when the cause looked darkest, Ceslaus mounted the ramparts with a crucifix in his hand. While the Tartars gazed in astonishment, a huge ball of fire descended from heaven and settled above him. Arrows of fire shot out from the heavenly weapon, and the Tartars fled in terror, leaving the city unmolested. Our Lady came to receive the soul of Blessed Ceslaus, who had been tireless in preaching her glories.